Thank you to all who participated in our latest stair design photo of the month competition. This month’s stair of the month was submitted by our national team, and it is a unique steel staircase designed and constructed for Cartier in San Francisco, California. This project was a collaborative effort between our national team and Dickinson Cameron Construction. It was sold by Don Wagner and managed by Roger Rock. Other national team members who helped move this project from inspiration to installation include Tex Squires, Kirt Ennley, Chad Gittens, Scott Kittle, Matt Dalton, and James Little. The gold handrails contrast the dark steel material used in this staircase to bring together a look of classy elegance. 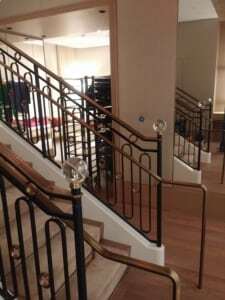 To complete this project, the railing is punctuated by unique, bronze metal infills and crystal newels. A steel staircase lends a sense of modern sophistication and style to a commercial space or home. 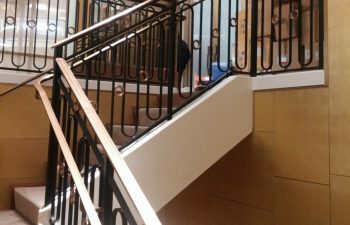 Both durable and aesthetically pleasing, our steel staircases are available in limitless designs and styles, and our innovative team is capable of bringing your unique vision to life. 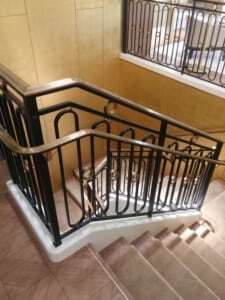 Our company possesses the experience, skill, and capabilities to construct the highest quality steel staircases, complete with handrail systems. We are proud to deliver quality products with cohesive design and flawless fit and finish. Visit our stainless steel staircase gallery for additional product photos and details.